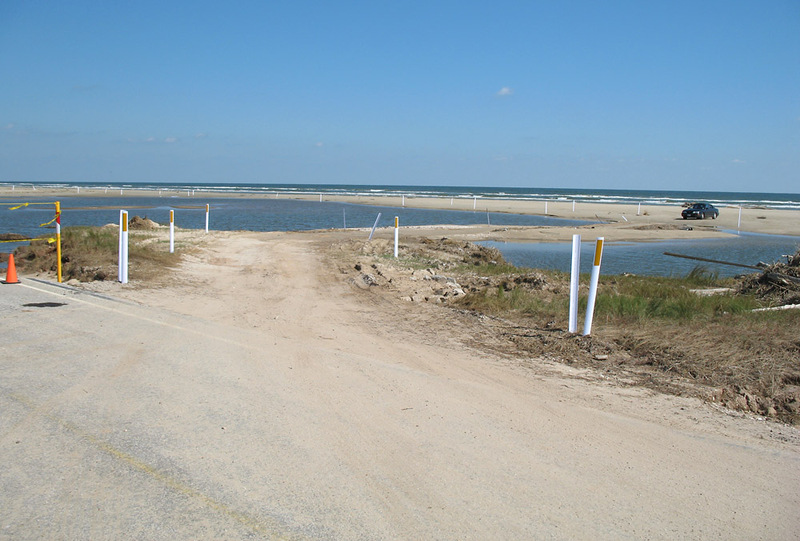 UPDATE: The Blue Water Highway was fully rebuilt and opened in its original location and configuration on May 4, 2009. 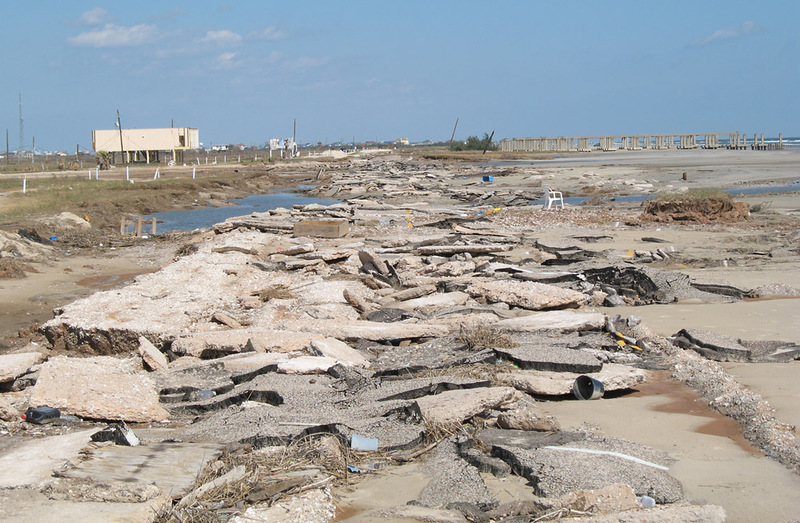 When category 2 Hurricane Ike hit the upper Texas coast on September 12 and 13, 2008, the most severe destruction occurred on Bolivar Peninsula east of Galveston. 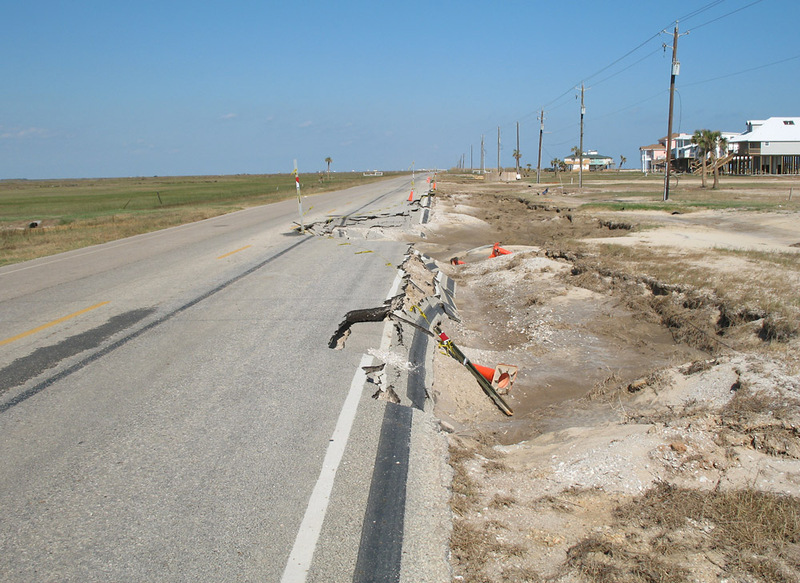 However, State Highway 87 on Bolivar Peninsula sustained minimal damage. 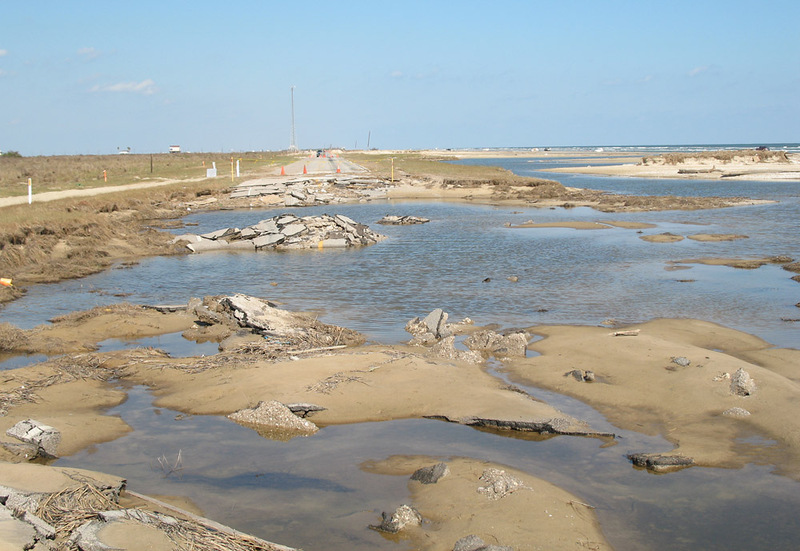 The most severe highway damage caused by Hurricane Ike occurred 50 miles southwest of Bolivar on the coastal highway between San Luis pass (at the southwest tip of Galveston Island) and the beachside community of Surfside near Freeport/Lake Jackson. 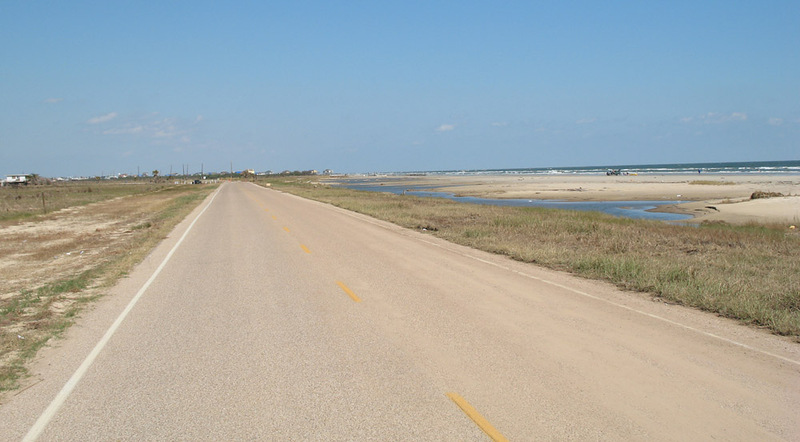 This highway is officially County Road 257 and is named the Blue Water Highway. 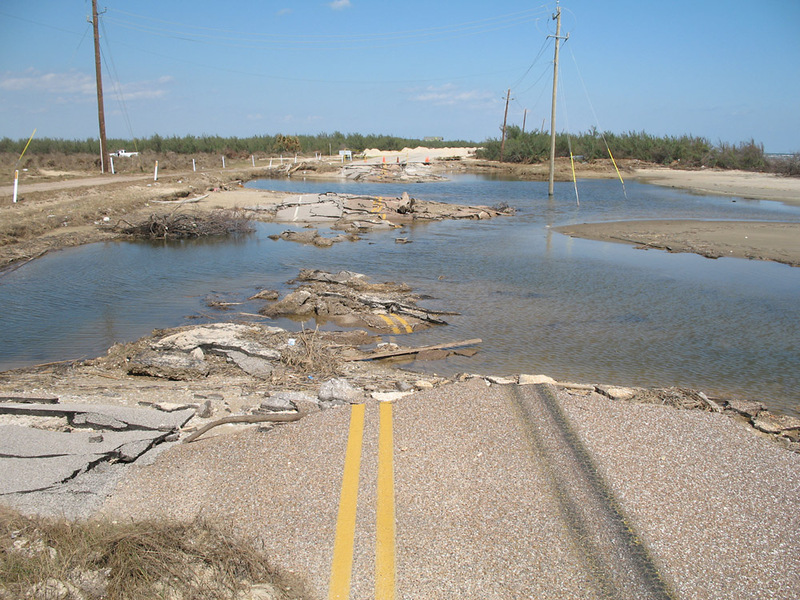 About 2.3 miles of the Blue Water Highway were totally destroyed and another 3.5 miles sustained serious damage. 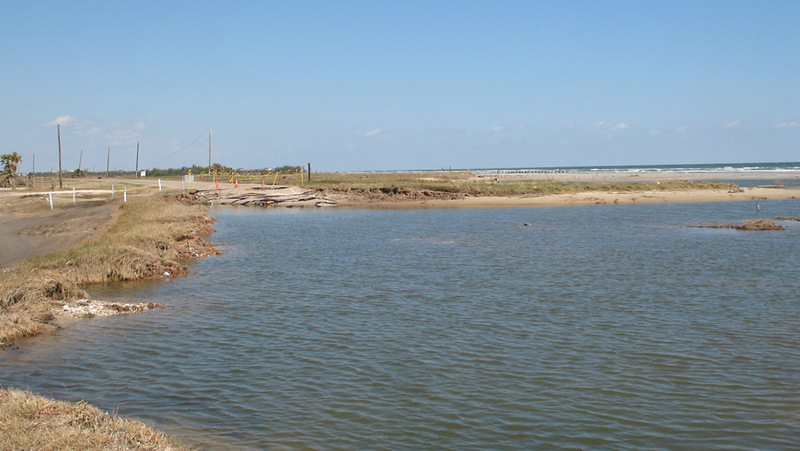 Although it may have been better to relocate the highway further away from the beach, any relocation would have required lengthy environmental studies with potential high costs due to wetland impacts. 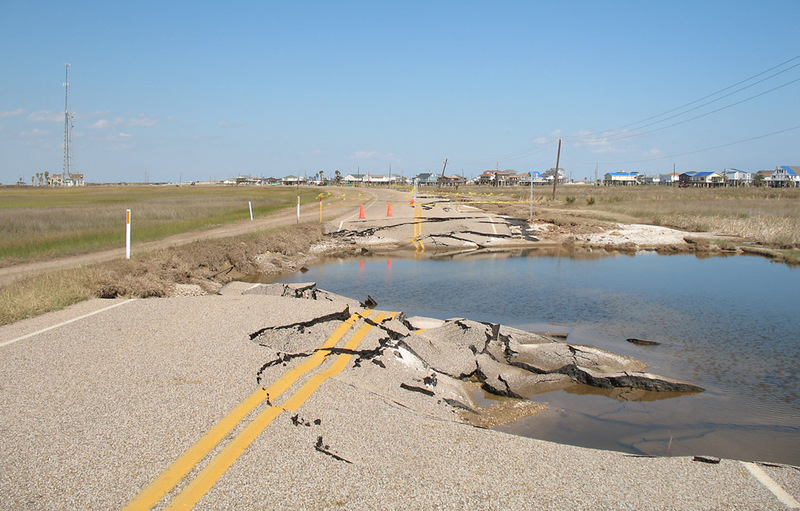 From a regulatory and disaster recovery perspective, the only quick option was to rebuild the highway exactly where it was. 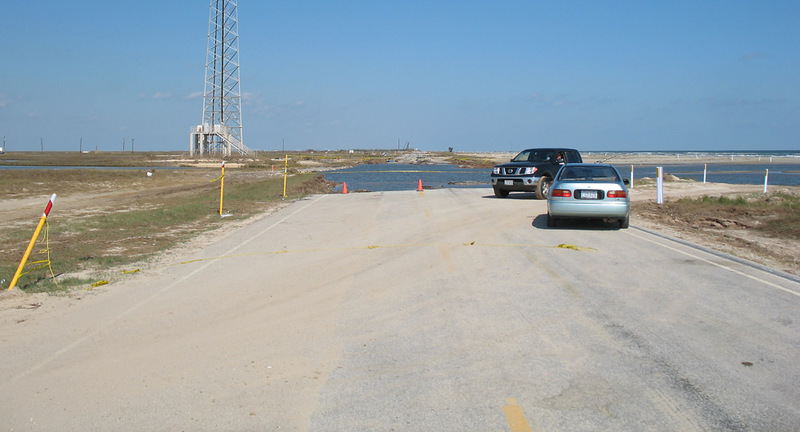 Washed-out sections were refilled with fill dirt, and the $3.5 million reconstruction job was finished on May 4, 2009. 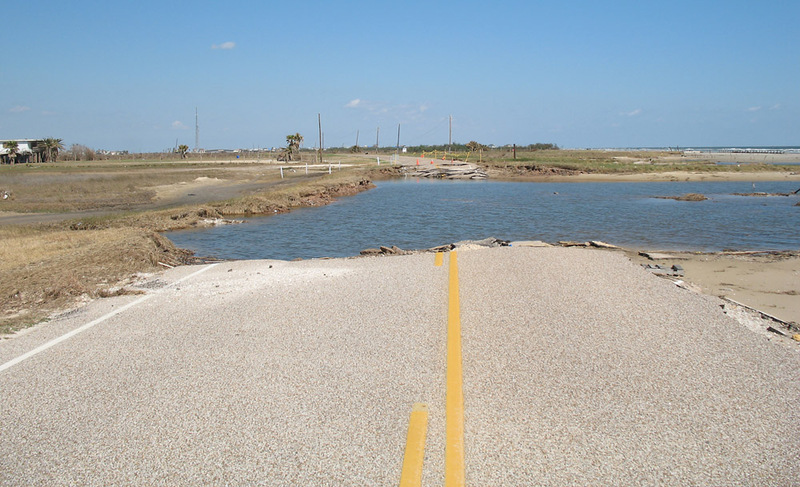 The Houston Chronicle reported that another $38 million in work was planned to protect the highway from future storm surges. 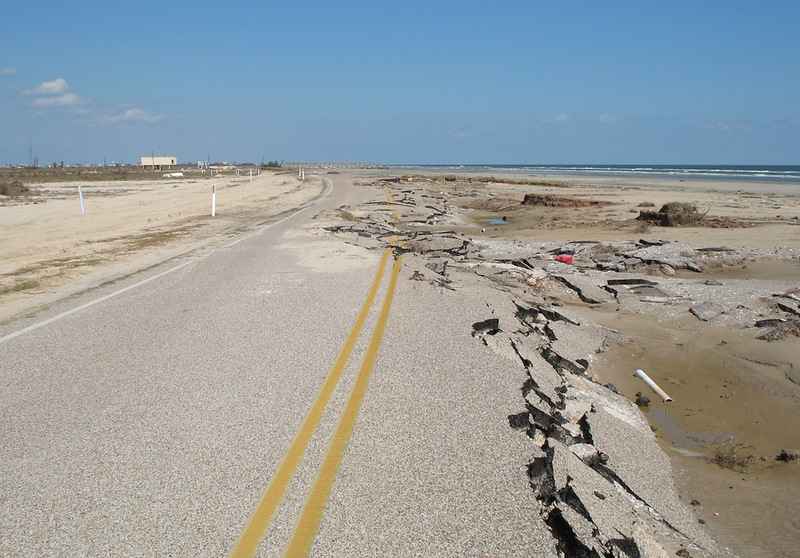 In some places the highway is now on the beach. 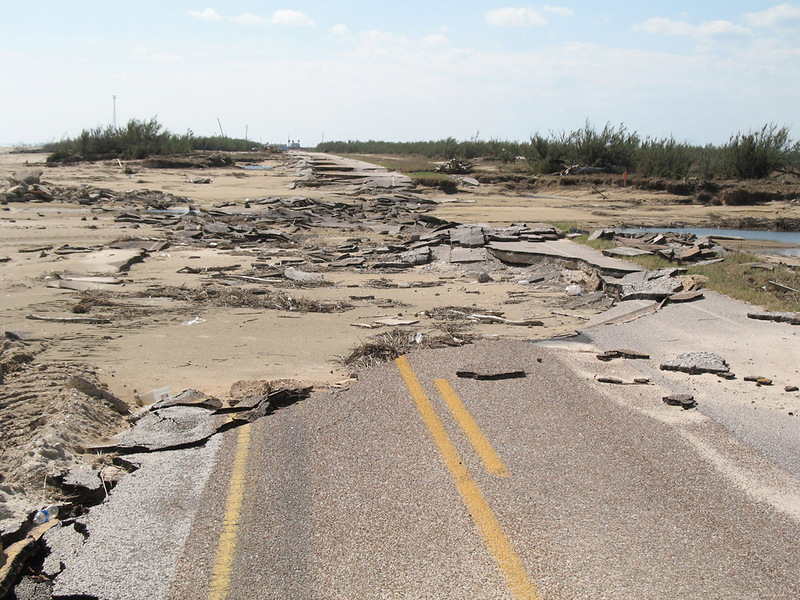 These photos start just east of Surfside and proceed northeast to San Luis Pass. 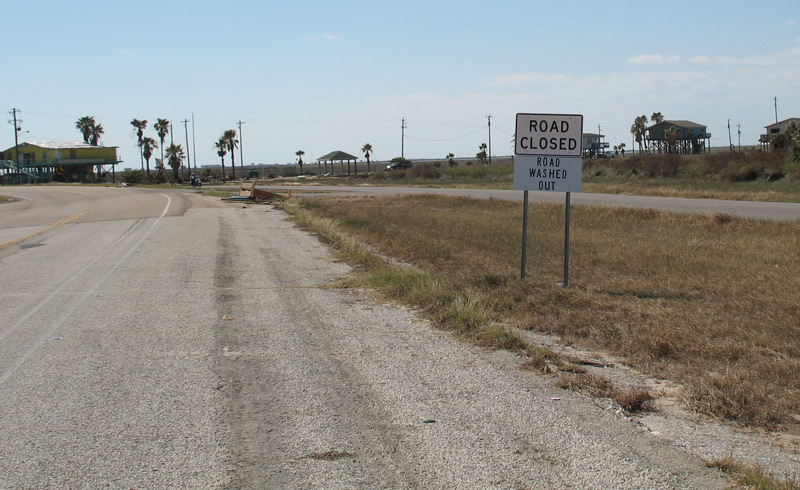 The first warning sign appears at the eastern end of the Surfside community. 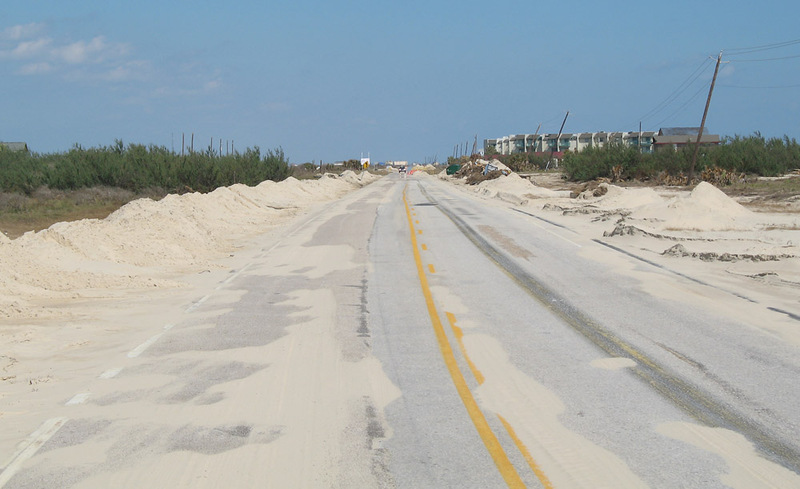 Here the highway is intact but was obviously covered by sand during the storm. 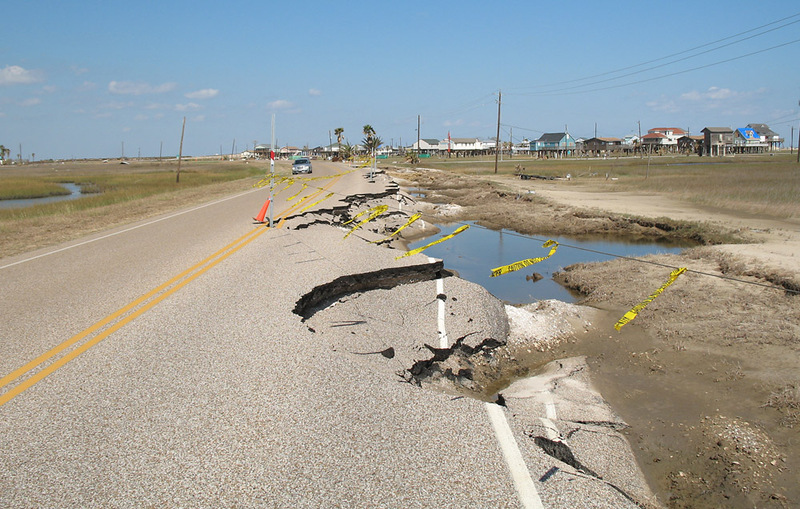 This type of damage is typical just east of Surfside, with the storm surge washing out the ocean-side (eastbound) lane, but leaving the westbound side intact. 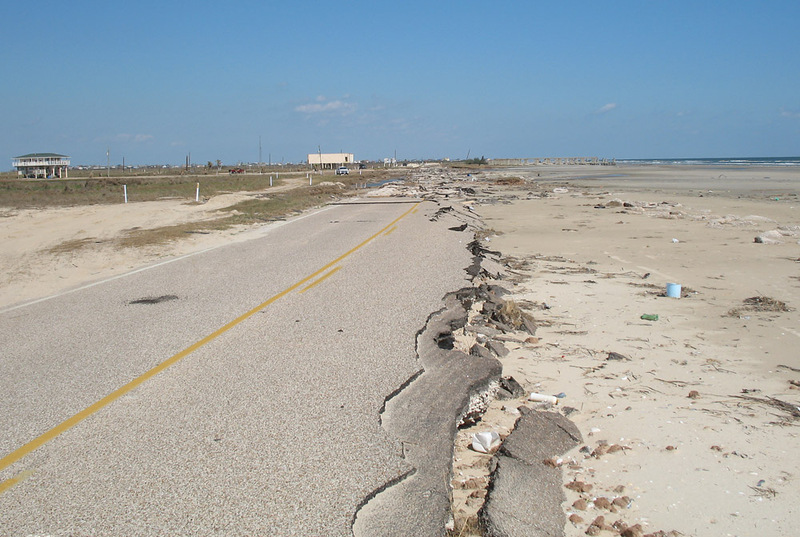 Another example of the storm surge damaging the edge of the highway. 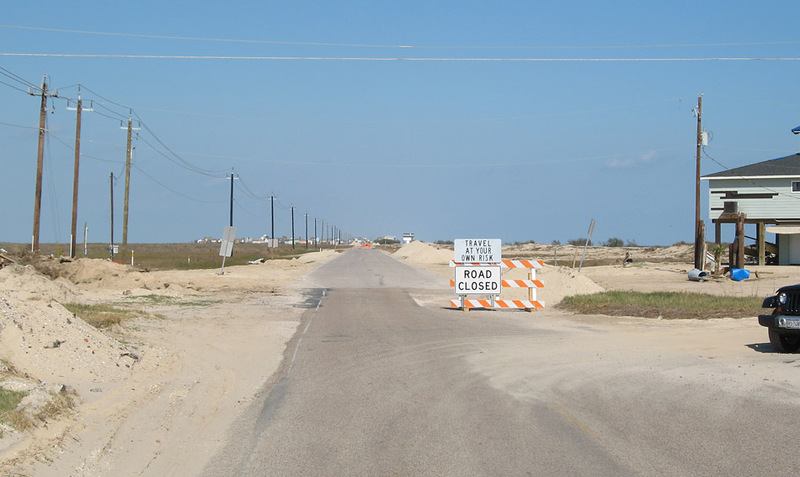 Ahead is the last cluster of beach houses, with more closure signs and a big chunk of the highway missing. Here are some beach houses. 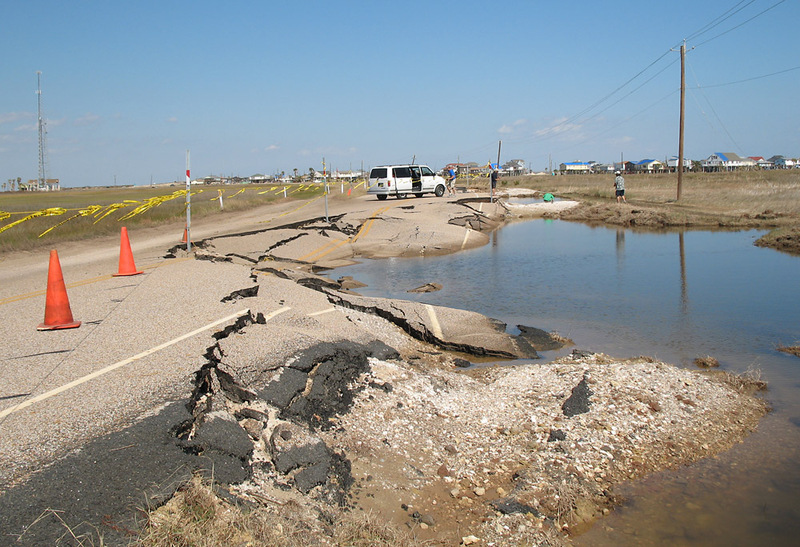 Damage was generally low to moderate in Surfside, compared to Bolivar where whole neighborhoods where wiped off the map. 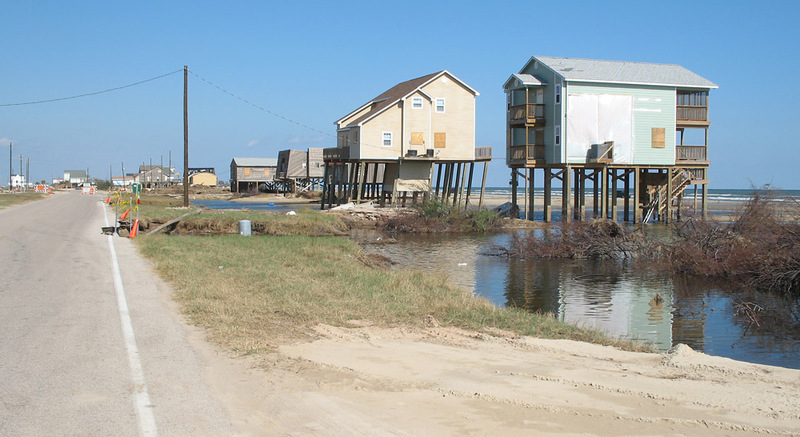 However, many Surfside houses are now standing in newly created pools of water, like the two shown above. This next warning sign informs motorists that they are traveling at their own risk. Another example of minor damage. 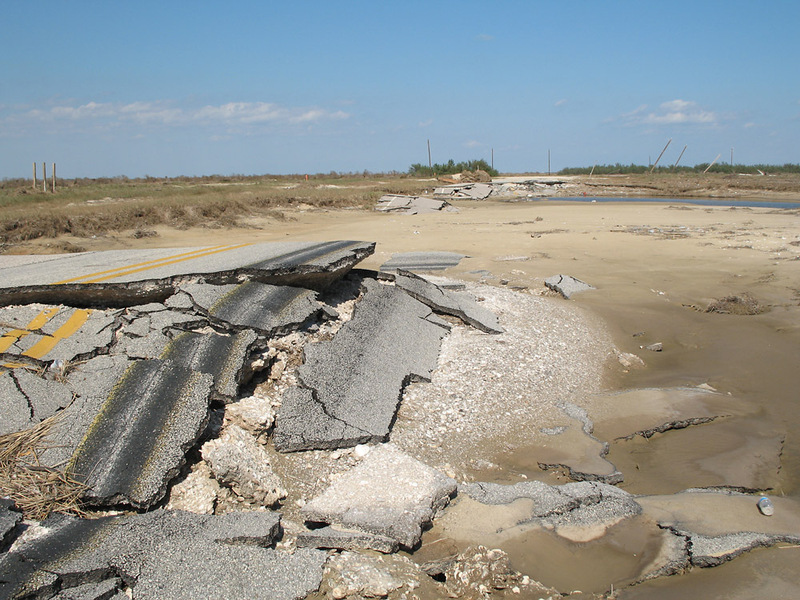 Ahead is an intact section of highway. 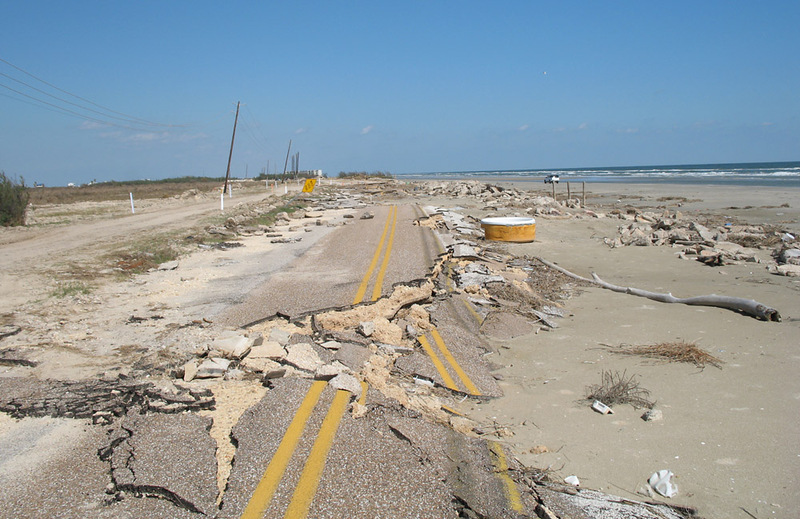 This is what the entire highway segment ahead looked like before the storm.....but not anymore! The first major washout is ahead. 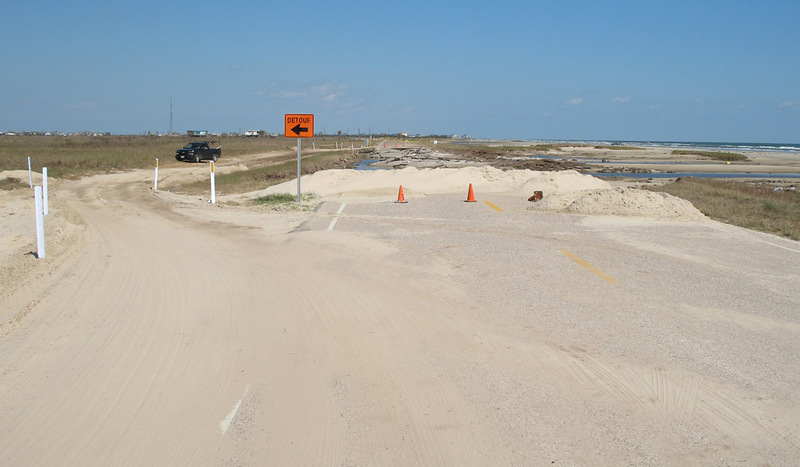 You can see how traffic is diverted to a makeshift dirt road on the inland side of the highway. Washout. 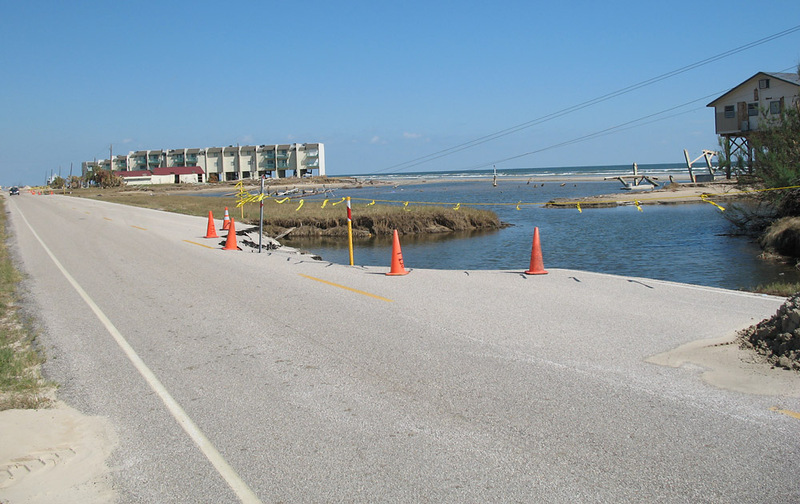 You can see how the storm created new tidal ponds which allowed the water to reach the road. 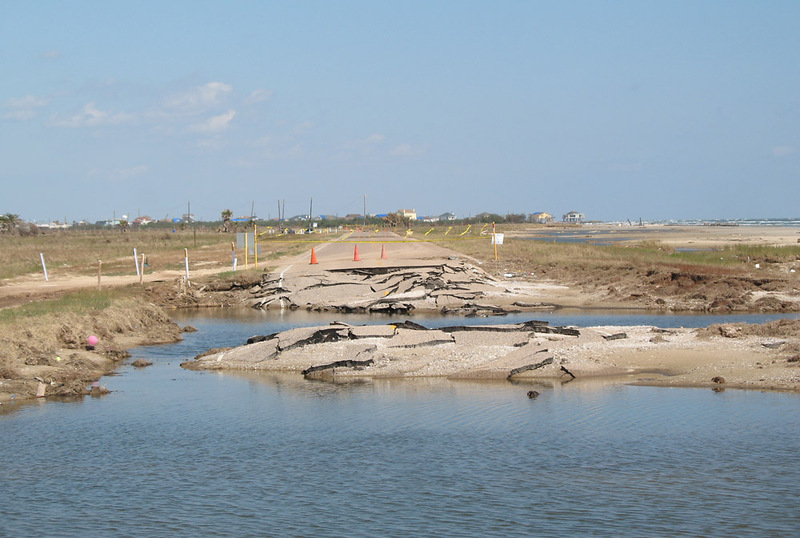 Another full-width washout caused by a new tidal pool. 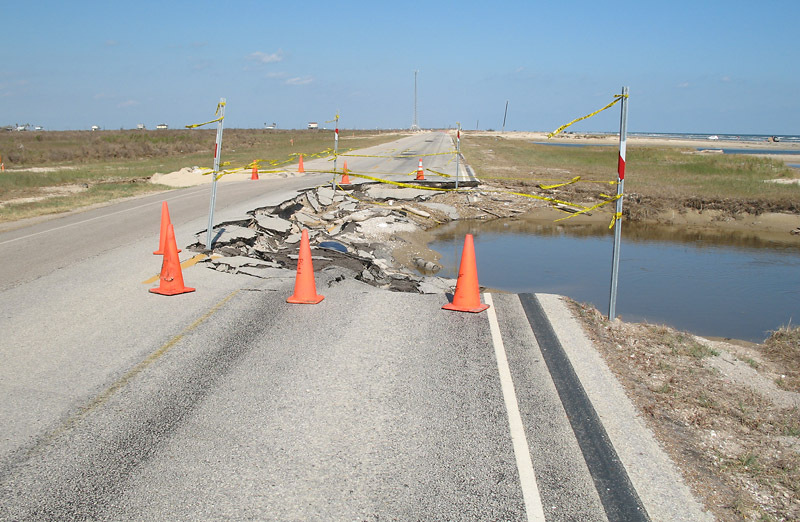 Here is the makeshift road around the washout. 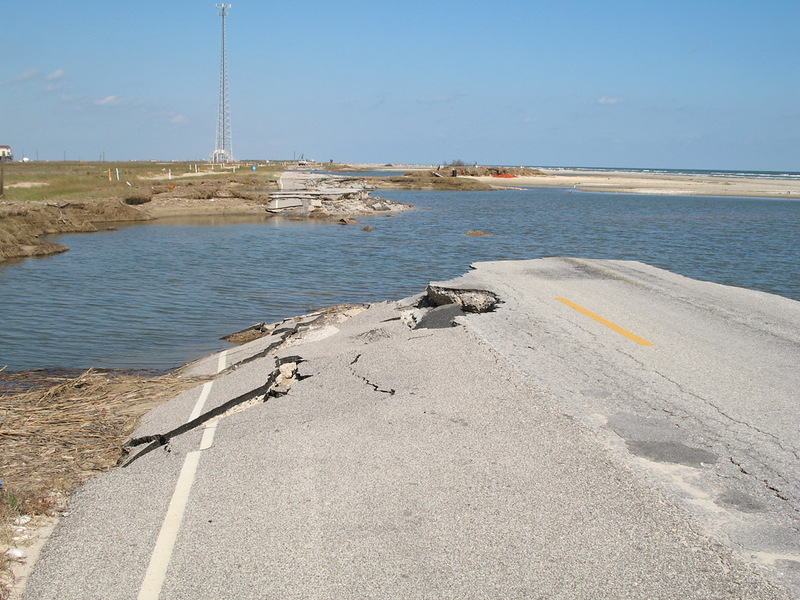 Ahead is another major washout and further ahead the highway is totally destroyed. 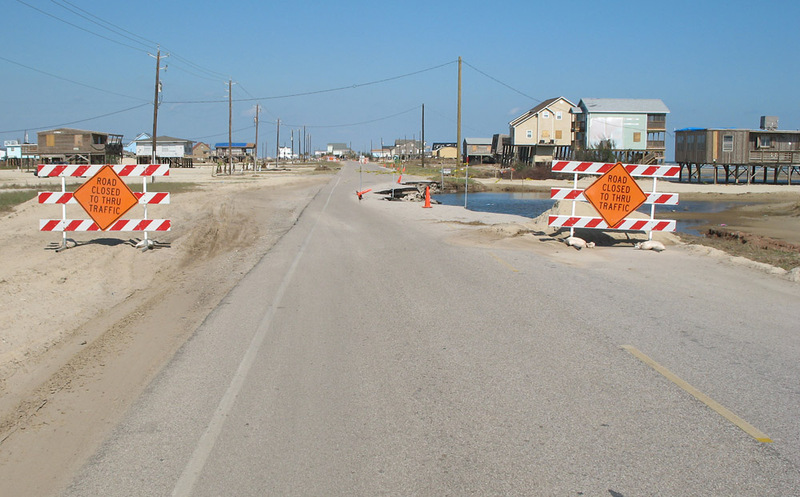 Traffic is diverted to the beach. 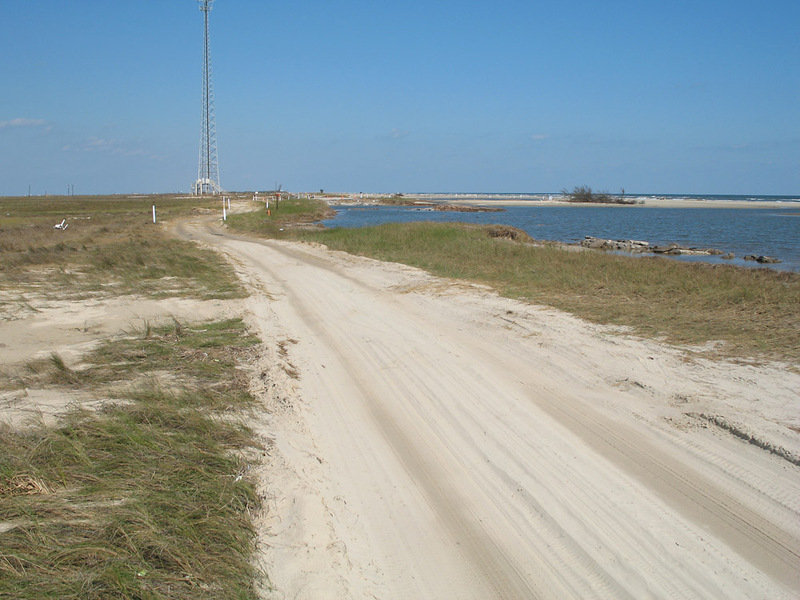 This is the connection to the beach, marked with white pylons. These white pylons mark the detour. 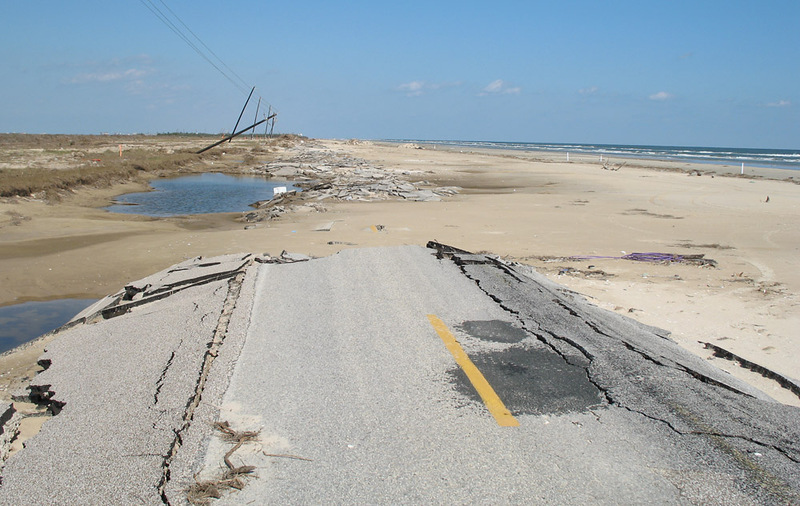 Washout with more crumbled highway ahead. 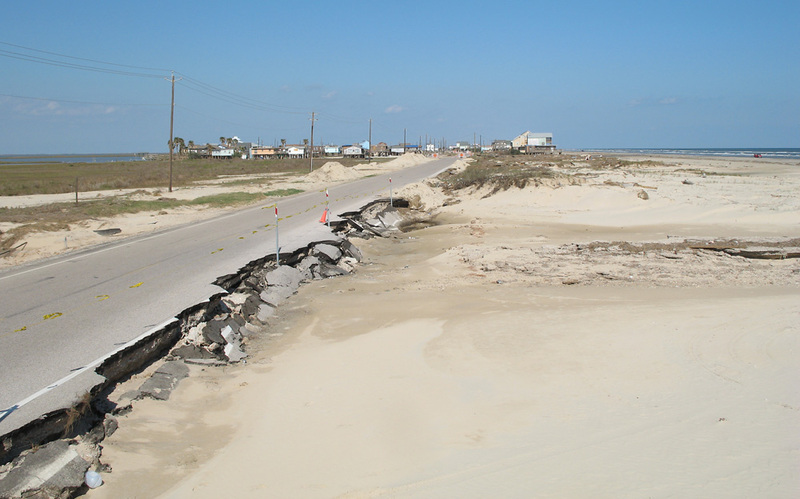 Here we can see the highway alignment is on the edge of the beach, and the highway was totally destroyed by the storm. 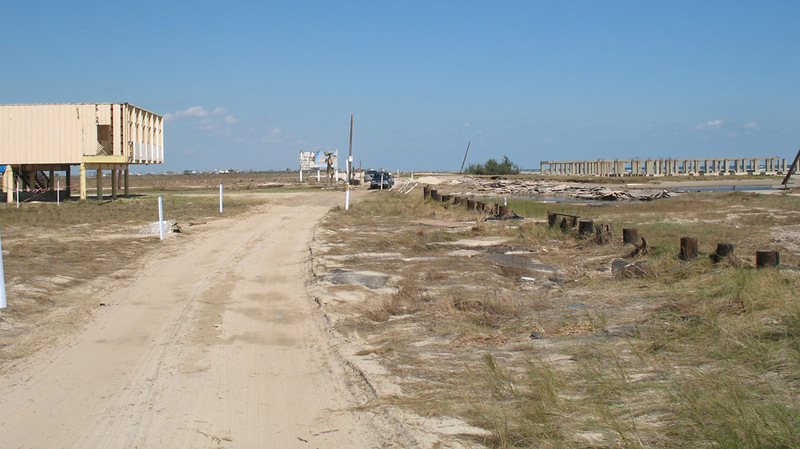 Any rebuilding effort will need to move the alignment further inland. Here a lot of debris has piled up on the highway alignment. 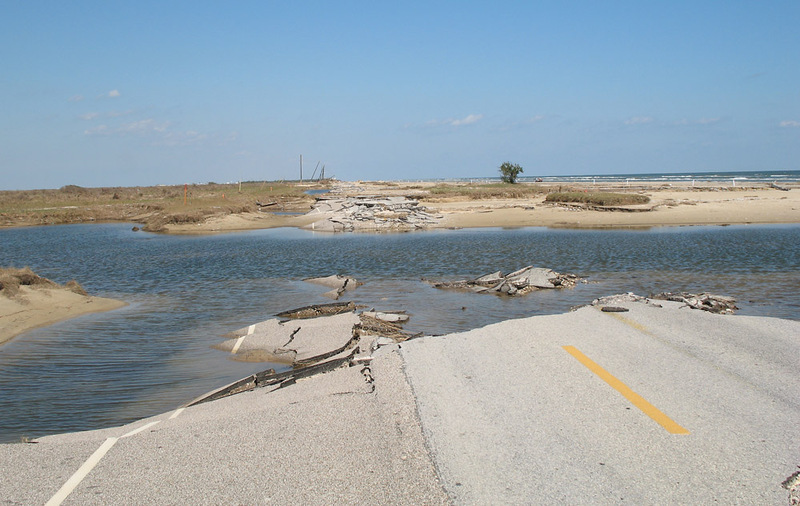 A surge of water took out the section of road ahead. The beach remains wide, smooth, and firmly packed, just like it was before the storm. 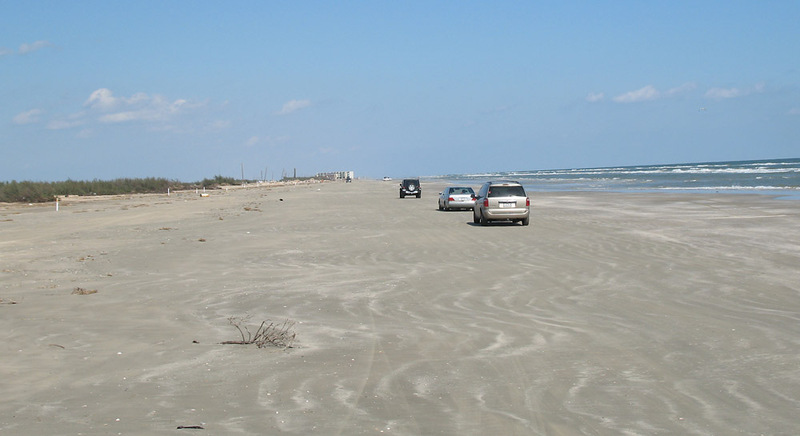 In fact, you could drive 60 mph on the beach if you wanted to. 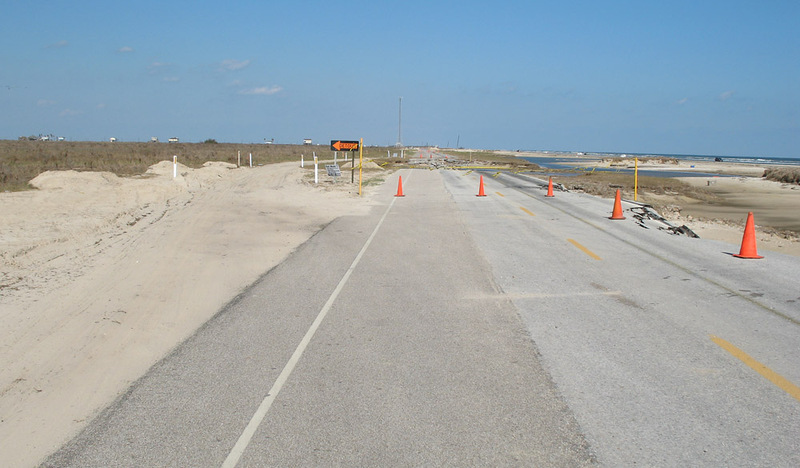 Here some vehicles are proceeding along the beach detour. 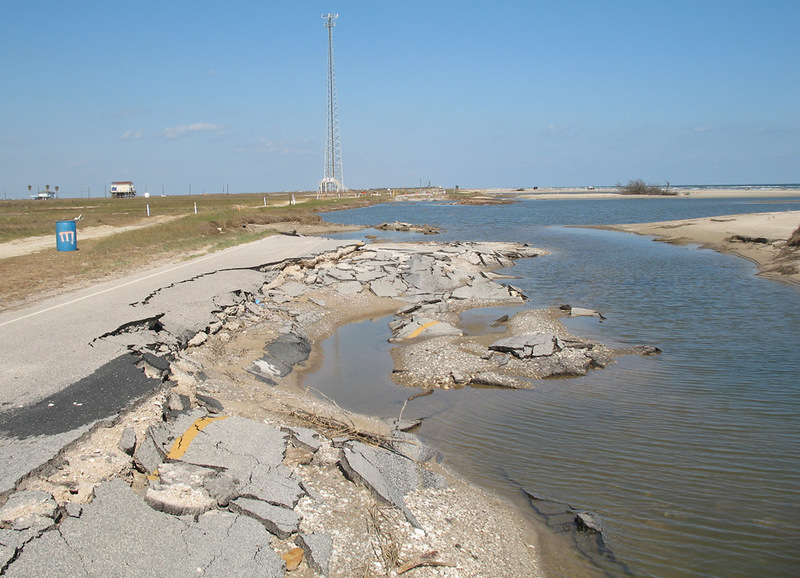 Chunks of highway are missing ahead. 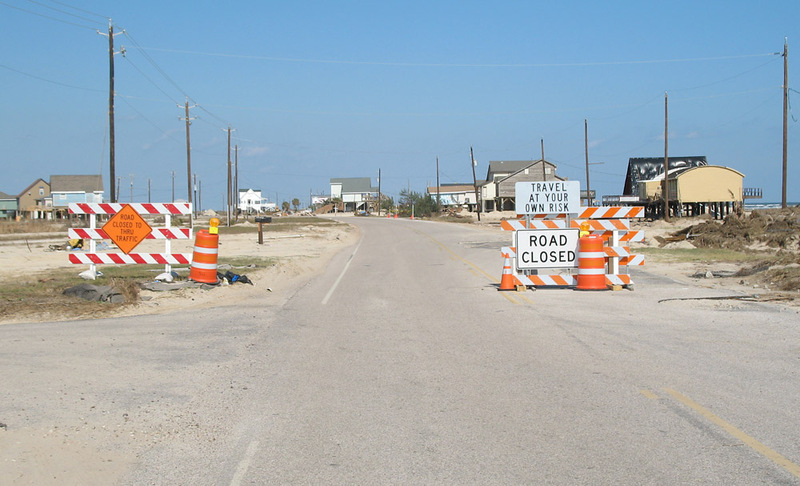 Here traffic is diverted from the beach back to the highway alignment. 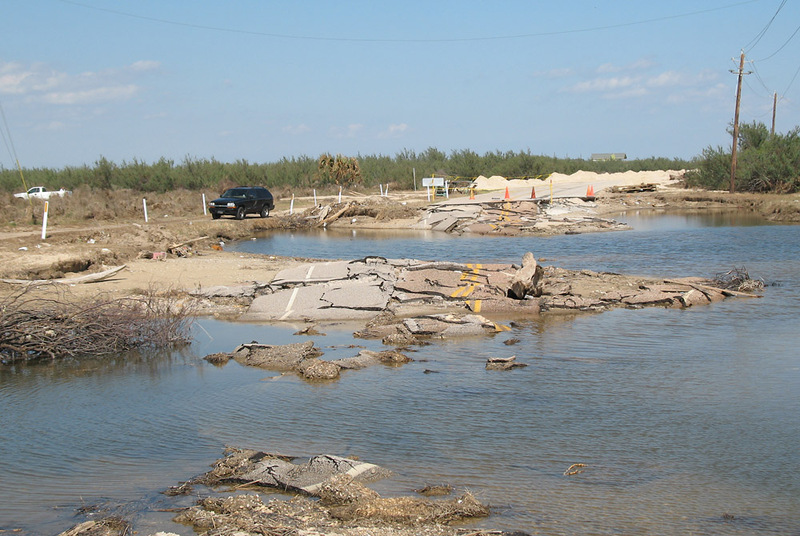 Another washed-out area with a makeshift road on the inland side. Another view of the washout above. Ahead we see an isolated condominum building. 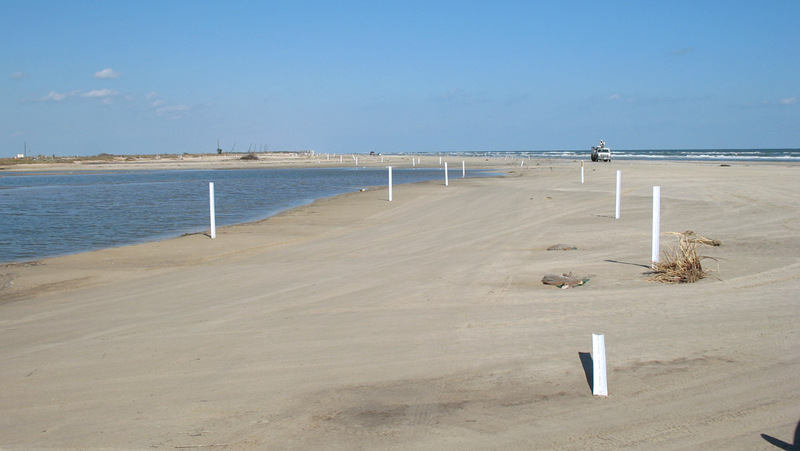 The road is intact but was obviously covered with sand. 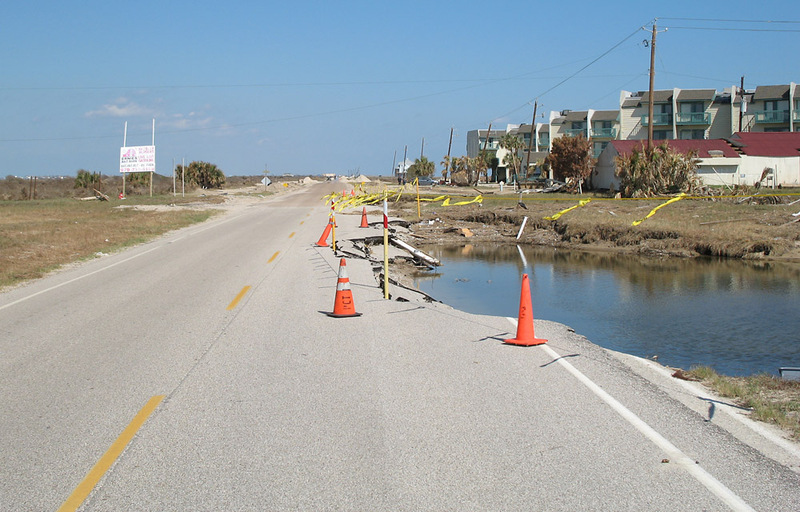 An encroaching tidal pool cut into the eastbound lane. 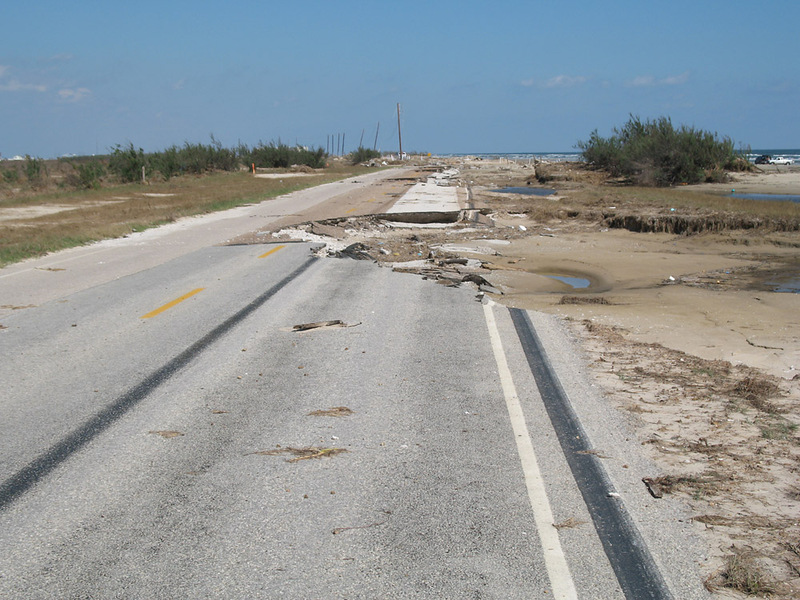 Here the highway veers toward the beach with another region of major damage ahead. 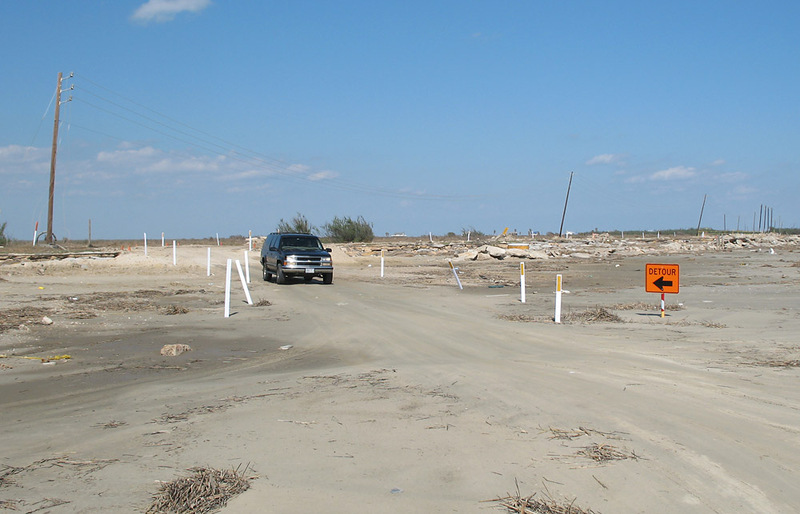 The makeshift road for vehicles is in the sandy area to the left. 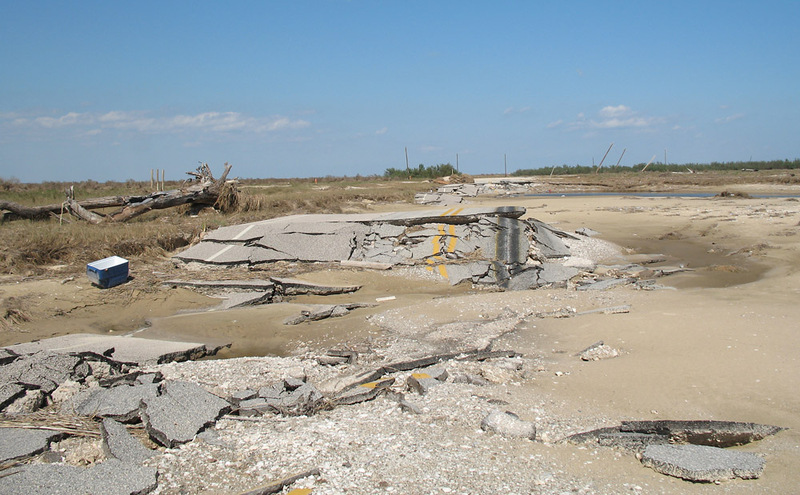 Here the highway will need to be moved inland if it is rebuilt. 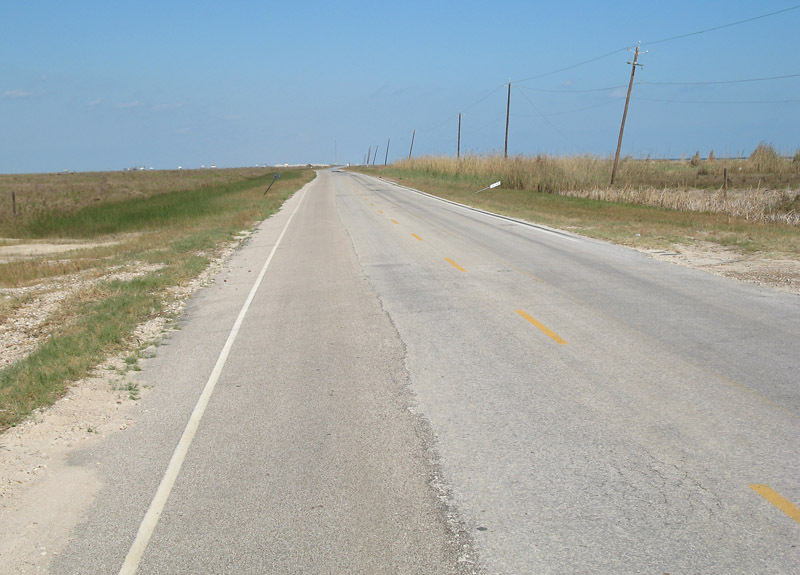 Ahead is a major asphalt debris field. 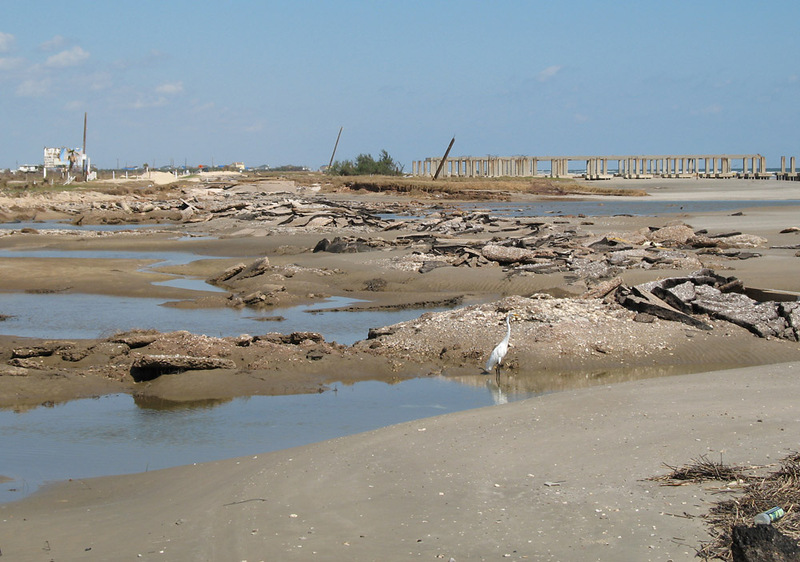 The piers ahead on the right were already abandoned in the ruined condition before Ike. 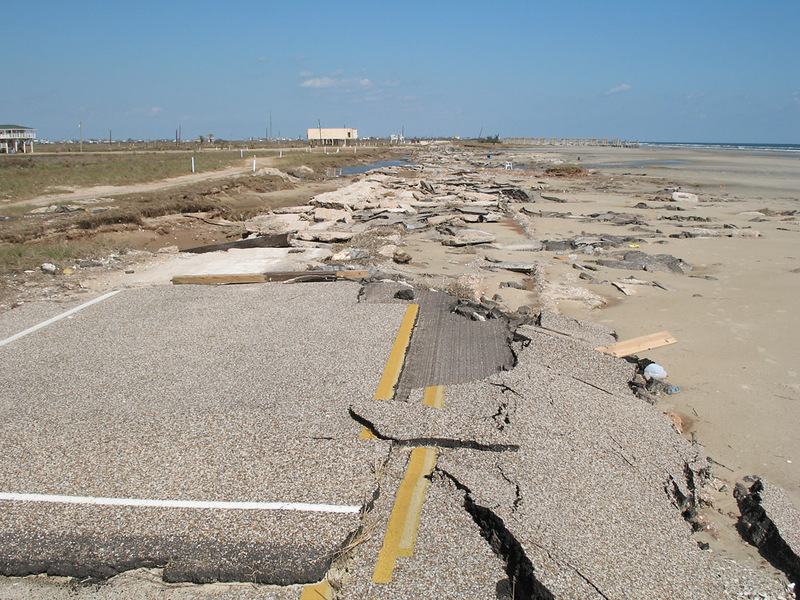 Here the makeshift road goes inland near a damaged structure. 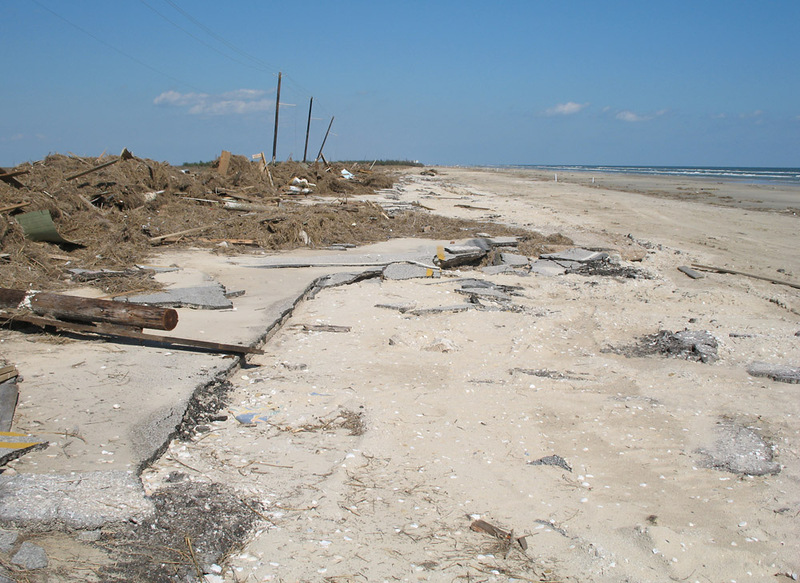 The community of beach houses ahead is at San Luis pass. 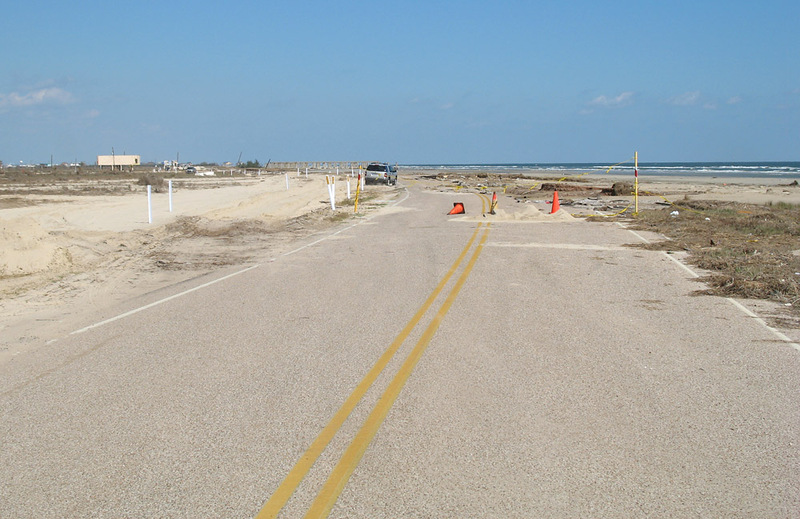 The highway is intact here, but there are no longer any protective dunes and the highway is very vulnerable to the next storm. The makeshift road on the left was bumpy and somewhate soft/muddy, and it was the only place where I was concerned if my Toyota Camry could get through. Minor washout in the eastbound lane. 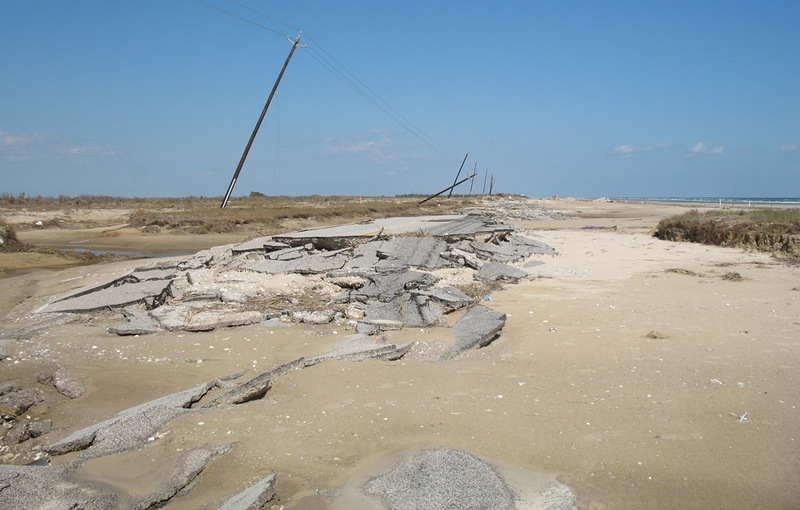 This damage is a long way inland from the coast. I'm guessing that the drainage ditch on the side of the highway became a conduit for the storm surge flow, undercutting the pavement. 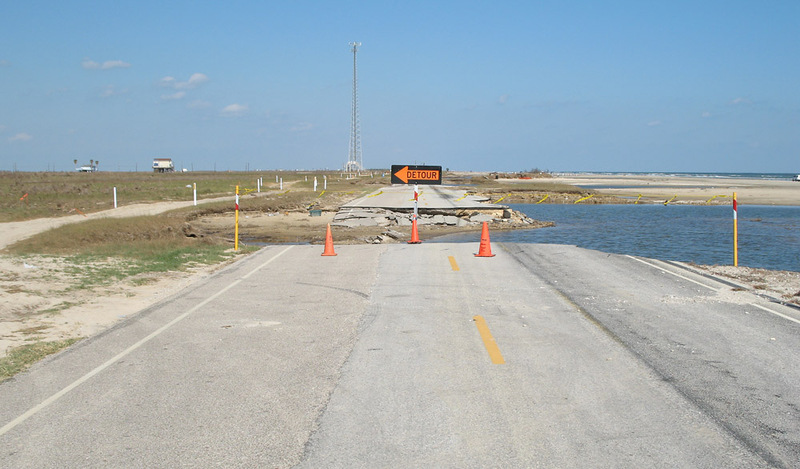 This is the last point of damage, and the San Luis pass toll bridge is just ahead. 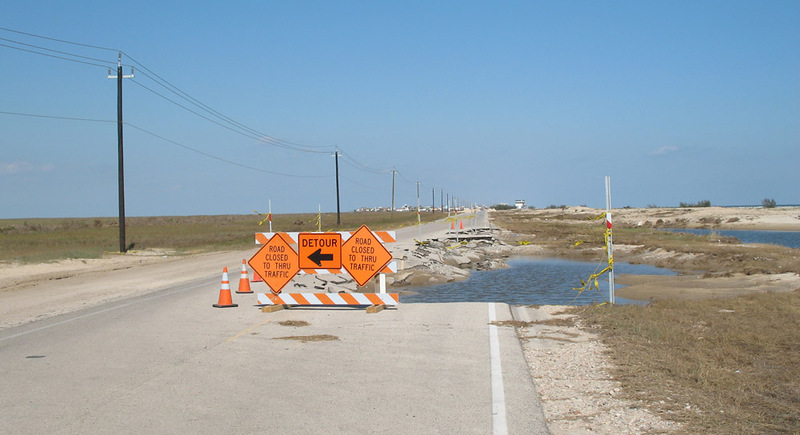 This is the sign for motorists in the westbound direction going to Surfside.